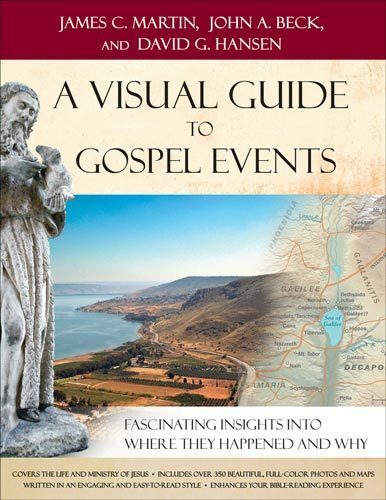 Discover the fascinating connections between Gospel events and their locations in A Visual Guide to Gospel Events. Why was Jesus baptized in the Jordan River? Where did Jesus heal people? Where did he choose to reveal his authority, and why? What is the significance of the locations where he told parables or performed miracles? Where did Jesus choose to interact with Gentiles? Why are the places of his crucifixion, burial, and resurrection important? You may also be interested in the Baker Illustrated Collection 6 Volume Set that includes the The Baker Illustrated Bible Commentary, The Baker Illustrated Bible Dictionary, The Baker Illustrated Bible Handbook, Visual Guide to Bible Events, The Baker Illustrated Guide to Everyday Life in Bible Times, and Visual Guide to Gospel Events.